Which lenses should you choose for your Canon EOS 5D Mark III? The second in our series of selecting the best-quality lenses for your camera concentrates on one of the most highly-anticipated cameras of our time, the successor to the hugely popular EOS 5D Mark II. But by the time it was announced, in early March, it’s probably fair to say Nikon had taken fair amount of interest away by announcing the 36M-Pix D800 and D800E models the month before. Be that as it may, there’s no denying the 22.3 M-Pix EOS 5D Mark III is a remarkably capable camera, and a formidable rival to the Nikon. 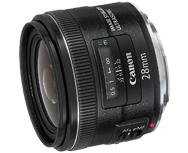 Adding to its range of image stabilised lenses Canon has brought out this new EF 28mm f2.8. 28mm is a useful focal length and while f2.8 is not very wide, the IS makes this an attractive proposition. Taking into account that this is optically pretty good too and the result is quite promising. Photographers looking for a good all round wide angle for their kit bag could do much worse.